Like with any pet, finding a breeder for red poodles that is both reliable and trustworthy isn’t always easy. It can be confusing to wade through the different options online to seek who is legitimate and who is not. There are also a number of non-legitimate breeding websites out there that posit as a breeder who cares, when, in fact, their practices mirror a puppy mill’s. Beware of those websites and ads that claim their puppies are “home raised” they are generally back yard breeders. Don’t be fooled—see what people say online, on review sites, or in testimonials about the breeder in question, and then decide from there. As with any contract, you’re going to want to understand the terms and conditions that you’re lending your signature to when purchasing a red poodle. Sometimes, breeders will include clauses that allow them to have a say in a major decision, like neutering or spaying the dog that some owners may not want. Whatever the situation may be, just make sure the contract you’re agreeing to balances the demands of yourself, the breeder, and, most importantly, the new poodle puppy you’re taking home. 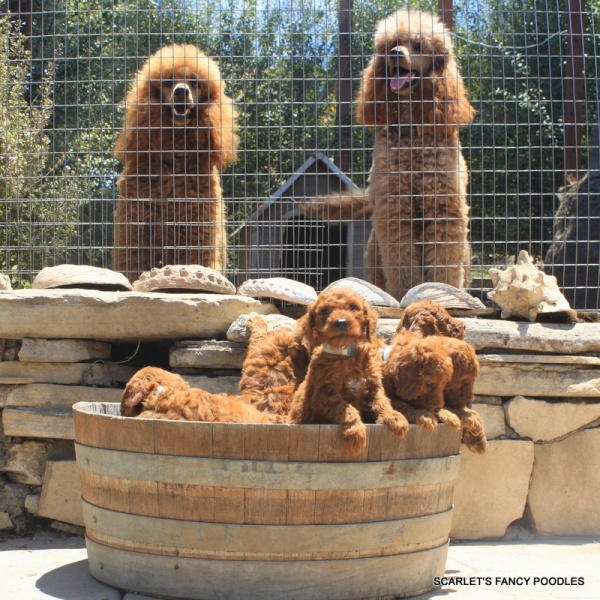 22Once you’ve taken these factors into consideration, we hope you’ll visit Scarlet’s Fancy Poodles, where every day, we work to find our red poodles the homes and owners they deserve. You have the power to take the worry out of buying your puppy on line. There are alot of advantages to being able to buy a puppy on line. You now have the ability to reach far beyond your local area, and can now reach people who are excellent breeders, people who will not compromise their love of the breed, years of expertise, talent, and hard work. This is the kind of person you want to buy from. You want to buy a healthy puppy with a excellent Poodle temperament. We have provided you a guide with questions to ask the prospective Seller – The Scammers are counting on you not knowing the information in our guide, and not asking the questions we have provided for you. Can I visit the puppies to see how you raise them? Do your puppies have the needed vaccinations for Parvo, distemper, and kennel cough? Do I receive AKC registration papers when I receive my puppy? Do you microchip your dogs and puppies? Do you have a Vet check the puppies before they are sold? Can you provide me with a signed Vet check by a licensed veterinarian that includes the record of the puppy’s health and microchip number? Do you Optigen test your breeding dogs? Do you DNA test your breeding dogs? Will I receive copies of the DNA testing? Does the lines of dogs you breed ever shown signs of: Seizures, thyroid disorder, renal, eye, hip dysplasia, leg perthes, cushings, addisons or any other disorder? If a breeder has been breeding long enough, they will have experienced at least some disorders and will be honest with you about this, and how they worked through it. Do you have a written Health Guarantee? Rule of thumb: The more “Yes” answers you get, the better the odds are that you will get a good puppy. Beware of people saying the puppies are home raised. (They are probably backyard breeders). And NEVER buy a puppy from a petstore, because as you may know they buy their puppies from puppy mills or back yard breeders. If a seller seems unsure of what you are asking, or dodges your questions, that is a red flag to look elsewhere. We wish you the very best in finding your new family member. PUPPY MILLS SELL THEIR PUPPIES THROUGH ONLINE BROKERS OR PET SHOPS. Puppy Mills are operating without regard for their dogs, physical or mental welfare. Buying a puppy that has been bred in a in unhealthy, inhumane conditions make the odds very real that you could buy a puppy that may have temperament disorders, or will develop life threatening health conditions. The puppy may cost you less in the beginning, but may cost you much more in time and veterinary expenses. Not to mention the heart ache of owning an unhealthy pet. Be aware of the temptation to impulse buy “falling in love at first sight” when you go to a petshop. Poodles can have a life span of up to 18 years. You are looking for a Poodle, now you have a chance to pick the perfect family member if you do a little investigating before you buy. Over the years I have had conversations with alot of heartbroken people who have just lost their beloved pet because of a genetic disorder that the pet was born with. DO YOUR PART TO STOP THE CRUELTY IN PUPPY MILLS. If you go to a breeder whose environment does not look clean, does not smell clean, puppies and adults do not look healthy and happy it is a puppy mill. Do not buy from this breeder. If the environment looks good, ask for the Vet letter. Ask the breeder to scan the puppy for it’s microchip and check to see that the Vet letter has the same microchip number. Look to see if the Vet noted any abnormalities. Last make sure that the breeder provides you with the Opti-Gen certificate for the sire. Over the years I have had conversations with alot of heartbroken people who have just lost their beloved pet because of a genetic disorder that the puppy was born with, but was not apparent when they bought the puppy. Nearly all genetic defects can be prevented by ethical breeding practices. My heart goes out to the adult dogs and their puppies that were born without regard for the quality of life all canines deserve. And for their owners who have spent countless hours and lots of money trying to keep their pet comfortable. Great puppies are not created out of chance or luck. They are a result of the work of a ethical, responsible, knowledgeable, experienced breeder. This kind of breeder is dedicated to breed their dogs to better the breed. They never compromise the health, temperament, or beauty of the future puppies.